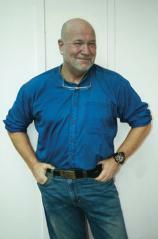 Randy Wayne White is the author of the Doc Ford novels and the Hannah Smith novels, and four collections of nonfiction. He lives on Sanibel Island, Florida, where he was a light-tackle fishing guide for many years, and spends much of his free time windsurfing, playing baseball, and hanging out at Doc Ford’s Rum Bar & Grille. A legendary charter captain and guide named Tootsie Barlow has come to Doc Ford, muttering about a curse. The members of his extended family have suffered a bizarre series of attacks, and Barlow is convinced it has something to do with a multiple murder in 1925, in which his family had a shameful part. Ford doesn’t believe in curses, but as he and his friend Tomlinson begin to investigate, following the trail of the attacks from Key Largo to Tallahassee, they, too, suffer a series of near-fatal mishaps. Is it really a curse? Or just a crime spree? The answer lies in solving a near-hundred-year-old murder…and probing the mind of a madman. Five hundred years ago, Spanish conquistadors planted the first orange seeds in Florida, but now the whole industry is in trouble. The trees are dying at the root, weakened by infestation and genetic manipulation, and the only solution might be somehow, somewhere, to find samples of the original root stock. No one is better equipped to traverse the swamps and murky backcountry of Florida than Hannah Smith, but once word of her quest leaks out, the trouble begins. “There are people who will kill to find a direct descendant of those first seeds,” a biologist warns her --- and it looks like his words may be all too prophetic. Marine biologist Marion “Doc” Ford carefully watches a video of a hooded man executing three hostages. The man is an American working with ISIS, and in the next few days, it’ll be Ford’s job, as part of his shadowy second life, to make sure he never kills anybody else again. But a lot can go wrong in a few days. And Ford has no way of knowing that not only will the operation prove to be a lot more complicated than he has anticipated, but that he’ll end up bringing those complications back with him to the small community of Dinkin’s Bay, where he’s long made his home. Doc Ford’s old friend, General Juan Garcia, has gone into the lucrative business of smuggling Cuban baseball players into the U.S. He is also feasting on profits made by buying historical treasures for pennies on the dollar. He prefers what dealers call HPC items --- high-profile collectibles --- but when he manages to obtain a collection of letters written by Fidel Castro between 1960 and 1962 to a secret girlfriend, it’s not a matter of money anymore. Garcia has stumbled way out of his depth. The house is historic, some say haunted. It is also slated to be razed and replaced by condos, unless Hannah Smith can do something about it. She’s been hired by a wealthy Palm Beach widow to prove that the house’s seller didn’t disclose everything he knew about the place when he unloaded it, including its role in a bloody Civil War skirmish, and the suicides --- or were they murders? --- of two previous owners. When a Crow Indian acquaintance of Tomlinson’s asks him to help recover a relic stolen from his tribe, Doc Ford is happy to tag along --- but neither Doc nor Tomlinson realize what they’ve let themselves in for. Their search takes them to Bone Valley, famous primarily for two things: a ruthless subculture of black-marketers who trade in illegal artifacts and fossils, and a multibillion-dollar phosphate industry whose strip mines compromise the very ground they walk on. A private museum devoted solely to Florida’s earliest settlers and pioneers has been announced, and many of Hannah Smith’s friends and neighbors in Sulfur Wells are being pressured to make contributions. The problem is, the whole thing is a scam. And when Hannah sets out to uncover whoever is behind it, she discovers that things are even worse than she thought. While trying to solve one of Florida’s most profound secrets, Doc Ford is the target of a murder attempt by someone who wants to make it look like an accident. Or is the target actually his friend, Tomlinson? What their small family of friends don’t know is that their secret pasts make it impossible for the two of them to go to the law for help. There is an assassin on the loose, and it is up to them to find the killer --- before he (or she) finishes the job. Hannah Smith makes her living as a fishing guide, but her friends, neighbors and clients also know her as an uncommonly resourceful woman with a keen sense of justice. Her methods can be unorthodox, though, and those on the receiving end of them often wind up very unhappy --- and sometimes very violent. When a girl goes missing, and Hannah is asked to find her, that is exactly what happens. At a reception hosted by a notorious Russian black marketeer, Doc Ford is able to get an underwater look at the billionaire's yacht. By the time Ford surfaces, everything has changed. Environmental extremists have herded everyone together and threatened to kill one hostage every hour until midnight unless their demands are met. The Red Citrus Trailer Park is inhabited mostly by illegal laborers. But the manager and his girlfriend want to sell it for some easy money --- and they'll do whatever it takes to drive the residents out.